A few years ago, I made potstickers for the first time, but in the manner of Sandra Lee because it was semi-homemade. I had wonton wrappers, so I just made the filling. Fast-forward to now, I read Jen's post about potstickers and I knew I should make some completely from scratch. It isn't that I was afraid, I just hadn't done it yet. 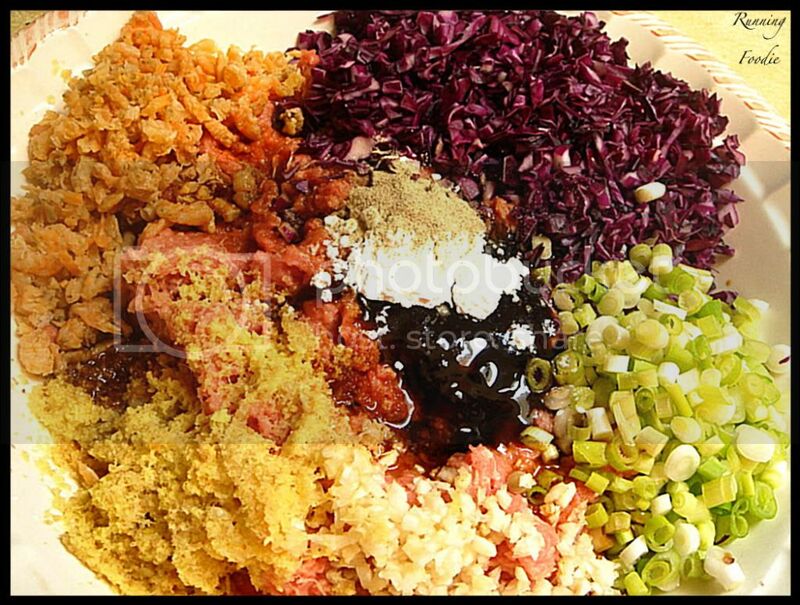 Starting from the purple stuff and going clockwise-to-middle: Red cabbage, green onions, minced garlic, grated ginger, reconstituted dried baby shrimp, ground turkey, soy sauce, oyster sauce, sesame oil, cornstarch, kosher salt and white pepper. This mixture made the kitchen smell like a Chinese restaurant! I used the dough recipe from a Chinese cookbook I've had for a while. It was pretty basic, flour, salt, and boiling water. I used about 1-2 tablespoons more water than the recipe called for. Here's what it looks like after it's all together. As you can see, it's still fairly dry. 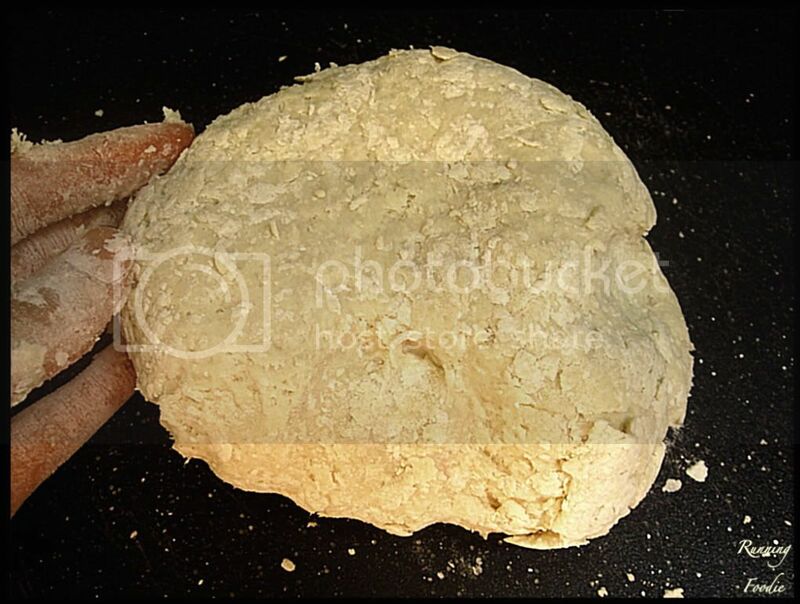 Knead for about 5 minutes, then let rest, covered, for 30 minutes. The texture now is much improved. Patience, Potsticker Padawan! 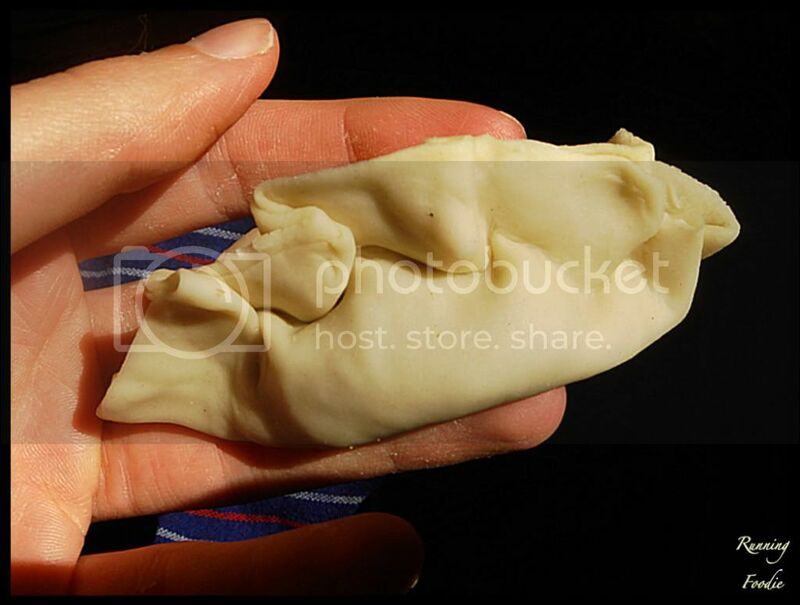 Following the shaping directions from Jen's post, I proceeded to create my very first potsticker. It took around 2-3 hours to shape 34 potstickers. The yield was supposed to be 48, so I did well for my first time. Looking back on it, I think I rolled each dough portion out a little too much, so the edges weren't in proportion to the size of the dumpling. My pleating technique was really good considering, though, and I look to improve it further next time. These are the ultimate make-ahead appetizers. It can get a bit overwhelming if you attempt to make as many as you need the day of serving, so plan ahead. I made all of them, minus four, the same night, but I froze half a batch while I cooked half right away (the skins were starting to stick to the sheet pan, that's why I froze the other half). Here's where the name comes from. What I like about these is there's a crispy portion and a doughy portion, so it's the best of both dumpling worlds, a fusion. 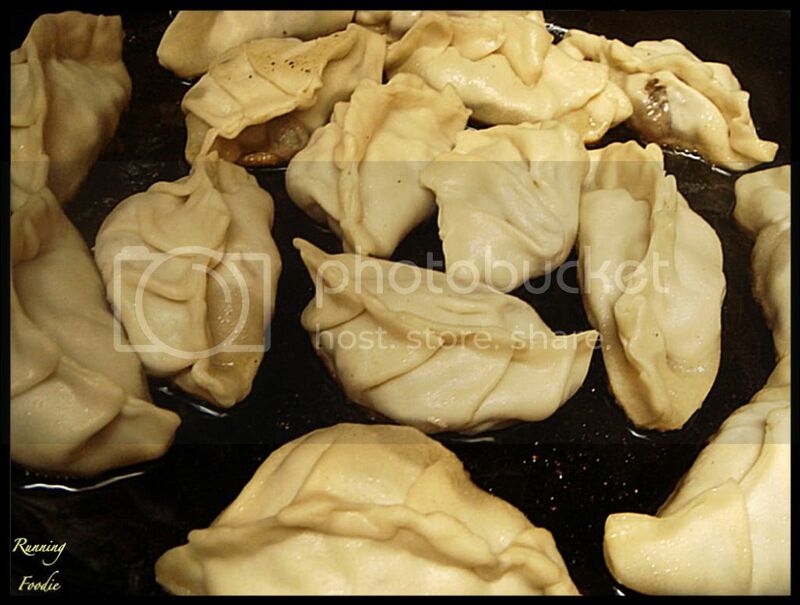 After taking a steam bath, the dumplings look a bit translucent. I'm not sure if that's how it's supposed to be or if that's because the dough disks were a little thin. Jen's potstickers look brilliantly white, which is what I heard that dumplings are supposed to look like once steamed. 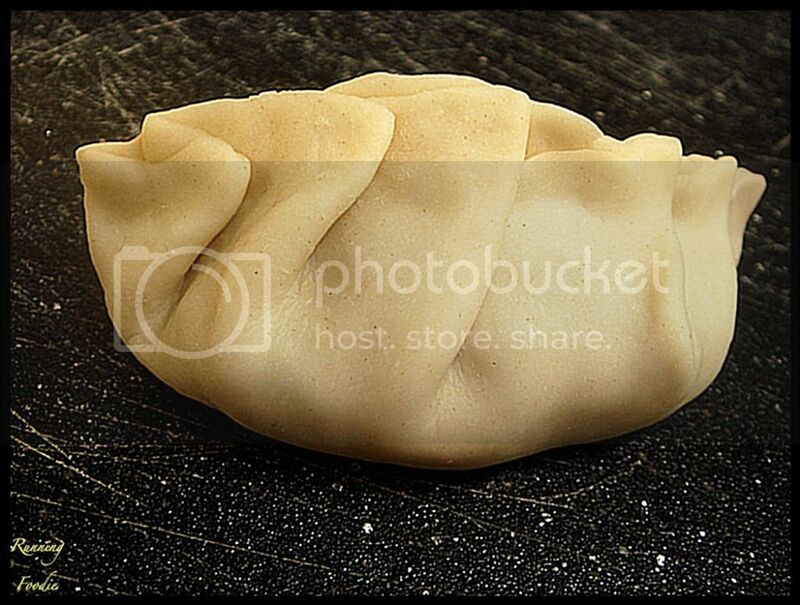 While editing the last 3 pictures, I realized that I forgot to take an innards shot! *hangs head in shame* The insides were cooked (very important), very moist, and the combination of all the ingredients gave it an amazing taste. There was a seafood essence thanks to the shrimp, which was what I was aiming towards. The skins were chewy and tender without being hard to bite through, meaning I didn't overwork the dough. What I liked the most was that the dough contained the aroma of the filling, but once you cut/bit into it the soul of the potstickers was unleashed! Potstickers are normally served with a dipping sauce, but since it was paired alongside sticky chicken I let that be the sauce used for dipping. Again, delicious! With a light grating of orange rind, this was the best meal ever, perfect while watching the Olympics. Makes about 4 dozen potstickers, about 6 to 10 servings. Prepare turkey filling and set aside. 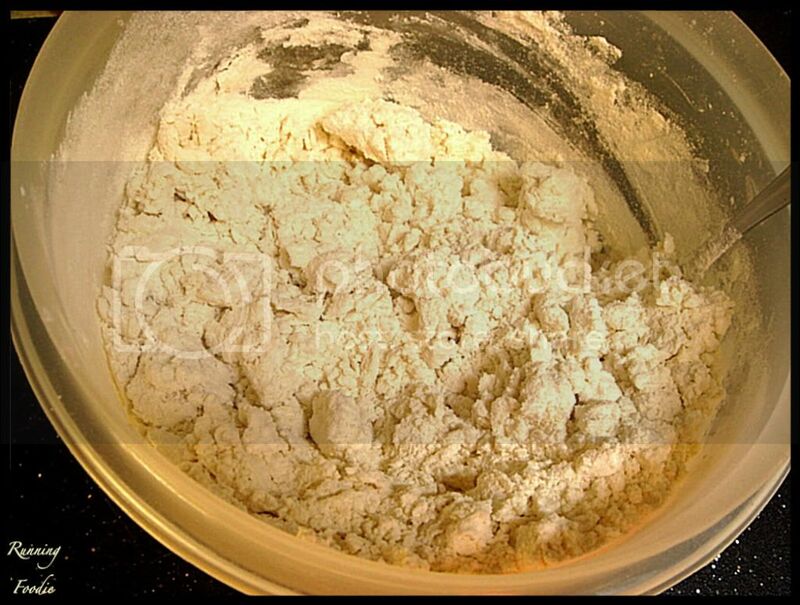 In a bowl, combine flour and salt. 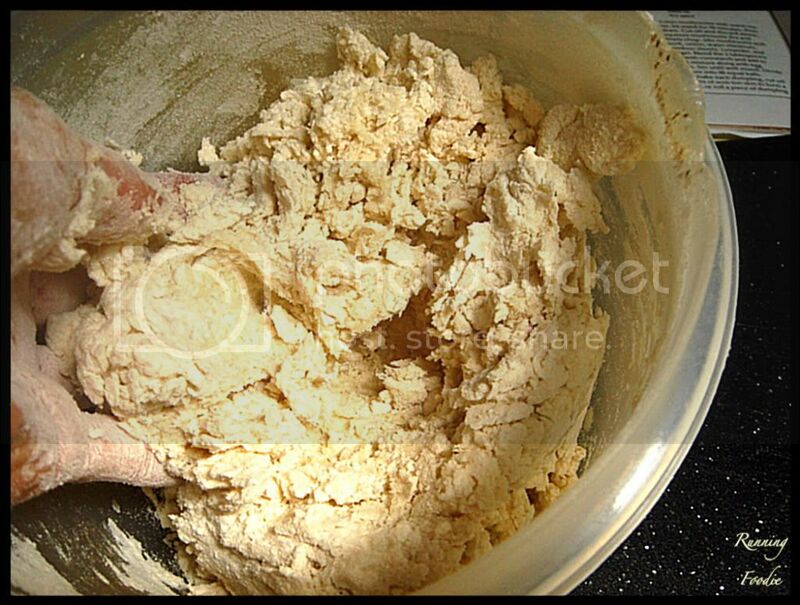 Mix in water with a fork until dough is evenly moistened and begins to hold together. 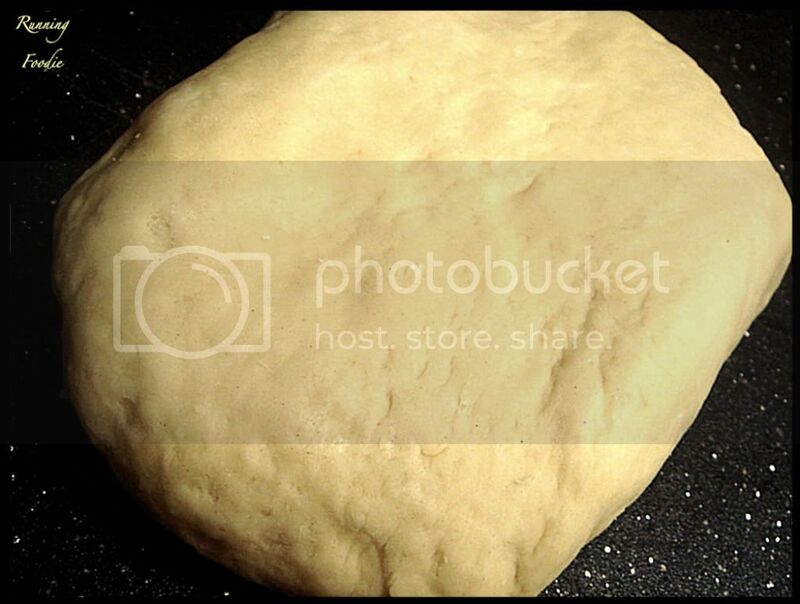 On an unfloured board, knead dough until it is very smooth and satiny (about 5 minutes). 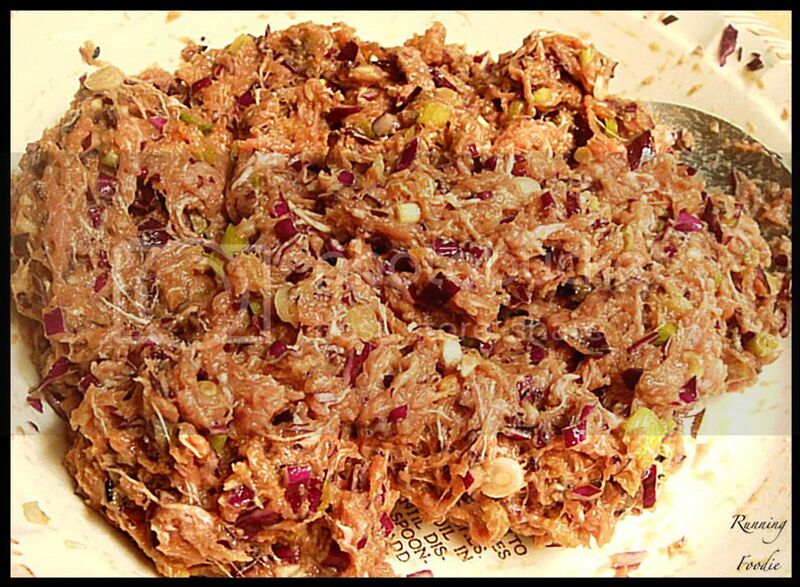 Cover and let rest at room temperature for 30 minutes. Dot each circle with 2 teaspoons to 1 tablespoon of filling (you'll be able to tell if you should use more or less). 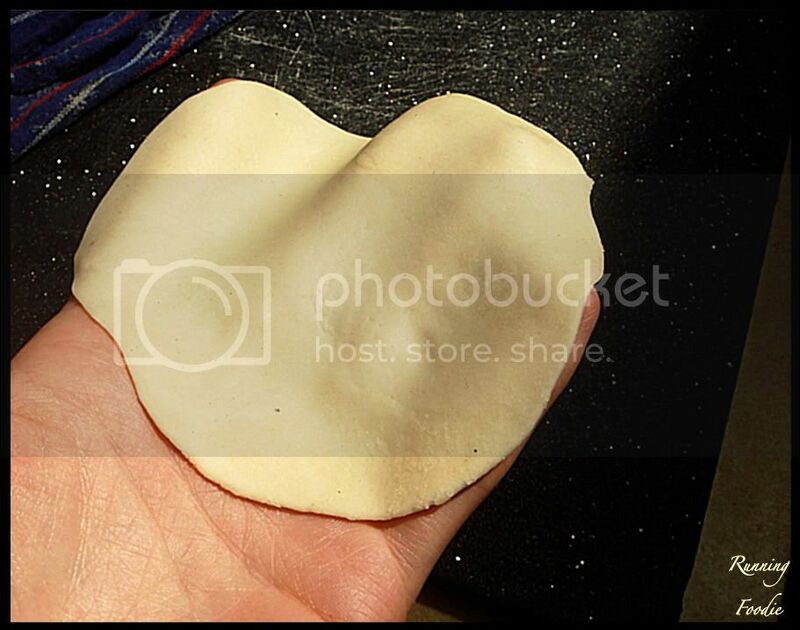 Follow the instructions for cutting and shaping as shown on Jen's blog post about potstickers. 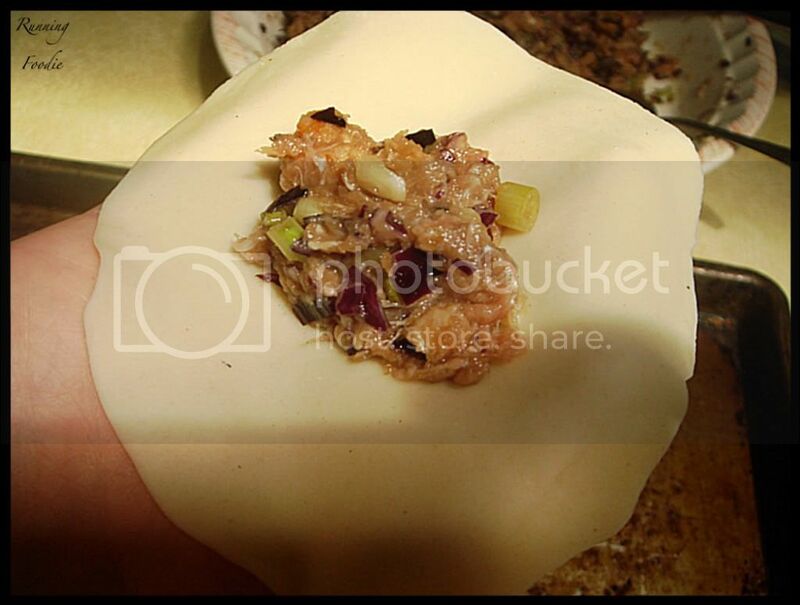 As you finish shaping each potstickers, place, seam side up, on a cookie sheet lightly coated with flour. Cover while you shape remaining poststickers. 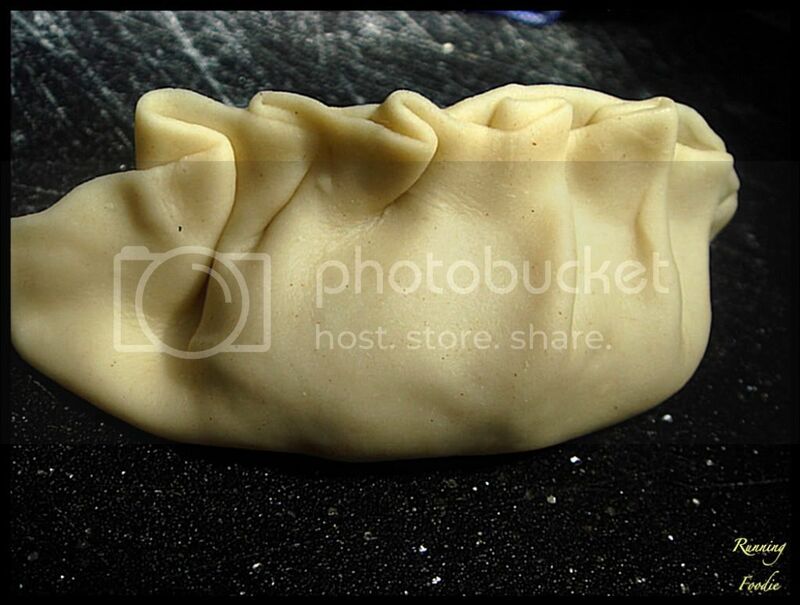 If made ahead, freeze potstickers in a single layer on a baking sheet until firm; then transfer to plastic bags and freeze for up to a month. Cook, without thawing, as directed below. Cook potstickers a dozen at a time. For each batch, heat 1 tablespoon oil in a heavy, wide frying pan over medium heat. 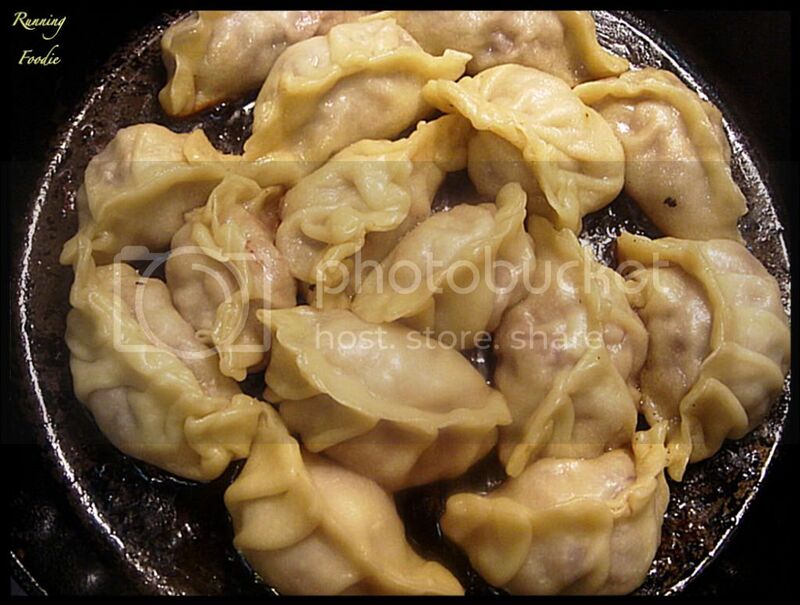 Set potstickers, seam side up, in pan. Cook until bottoms are golden brown (about 6 to 10 minutes). Pour in 1/3 cup broth or water and immediately cover pan tightly. 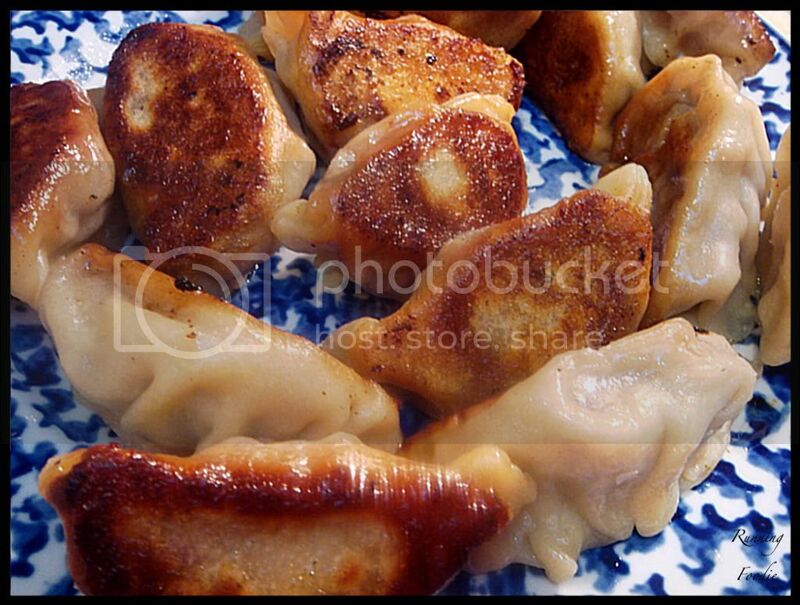 Reduce heat to low and steam potstickers for 10 minutes (15 minutes if frozen). Uncover and continue cooking until all liquid is absorbed. Using a wide spatula to remove pot stickers from pan, place them, browned-side up, on a serving platter. 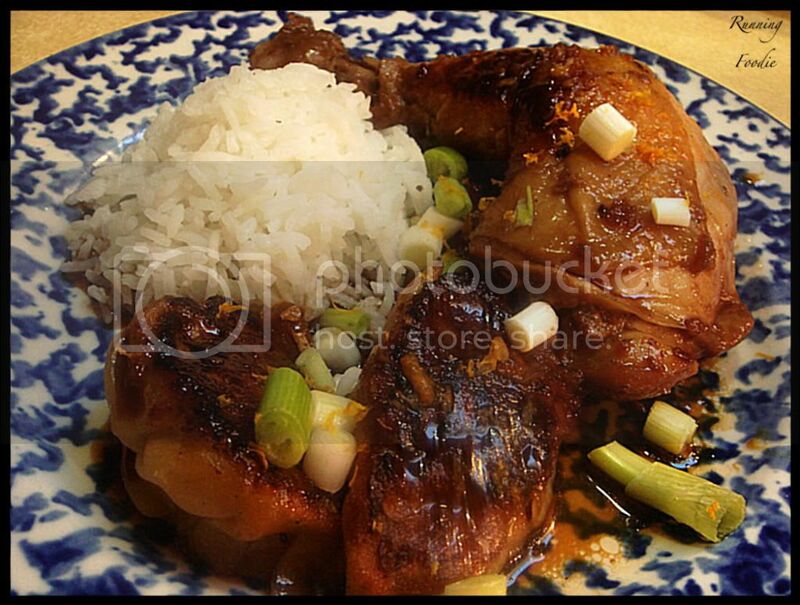 Serve hot, with choice of dipping sauce on the side. Christina, those potstickers are awesome. You even have the technique down and everything. I think I just fell in love with you. Hold on, let me check. Those look good - I tried something like this - i even have a picture of it I can send to you. It didn't turn out good though. 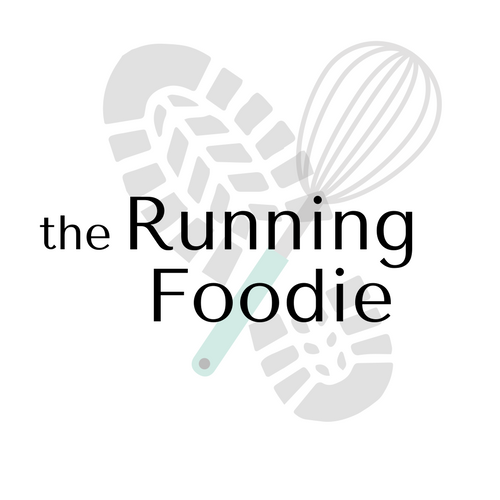 I followed something that Alton Brown had on his website...I'm never doing that again - lol. No innards shot?! What a shame! Glad to hear the filling was cooked. I can't believe you made your own potstickers! That is so cool. I love potstickers. I'll have to try making my own. Great post! I'm in love with potstickers but haven't tried making the dough myself. I'm bookmarking your post & will let you know if I have any luck. I had Dim Sum yesterday & am gonna make some dumplings. Nice blog, the title kinda describes me! Always had a great appetite, which has increased now I run. I'm lucky I burn it all off.